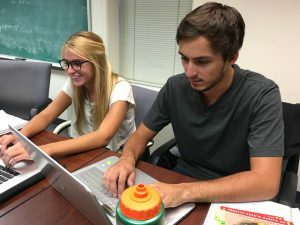 In an effort to bring The College of New Jersey’s English Graduate Program students closer together, profiles of various students will appear on this site throughout the year. These profiles should give you – be you an incoming student, current student, or faculty member – an insight into the complex, brilliant minds studying in our wonderful program. This month’s student is Steven Wills. Why did you choose The College of New Jersey for your undergraduate/graduate study? STEVEN: As cliché as it sounds, I was swayed by the atmosphere of TCNJs campus as soon as I stepped onto it for my first ambassador-led tour. I was torn between Rowan and TCNJ, and although Rowan was willing to give me much more scholarship money, I couldn’t resist the beautiful buildings, the relaxed feeling of the campus, and the prestige of its education program. Four years and an undergraduate degree in English Secondary Education later, I couldn’t be happier with my choice. What attracted you most to the 5-Year M.A. program? STEVEN: To be honest, it wasn’t so much “attraction” as it was “advice from my mom.” Having gone through a lengthy MBA program herself, she recognized the advantages to knocking out a graduate program in one extra year, and after a few years in the undergraduate program, I came to agree with her. 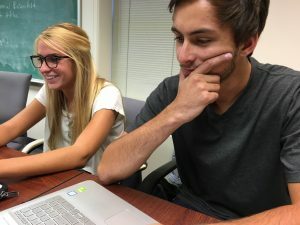 The benefits an advanced degree has for teachers is undeniable, and thanks to her advice, I’ll come out of the program with a leg-up on my competition. What do you plan on doing with your degree? STEVEN: I plan on teaching middle school or high school English. After being inspired by one of my own high school English teachers, I decided that I wanted to pass this kind of inspiration onto younger generations, regardless of what path that inspiration leads them towards. Which courses have proved to be the most interesting/fulfilling thus far during your graduate career at The College of New Jersey? Are there any courses you’d like to see added? STEVEN: In terms of fulfillment, I can’t deny that ENGL505 (Intro to Critical Theory) has truly provided me with a solid framework within which I can operate on the graduate level. Although difficult, I came out of that course with a solid understanding of many different theories that have already helped me critically analyze the literature I am studying. This semester, two classes I am taking are extremely interesting: ENGL521 (Women in Literature) and ENGL670 (Postmemory and the Holocaust). The former provides new perspectives when examining the intersections of gender and race within literature as well as in our larger society. The latter grasps with one of the darkest moments in human history, attempting to better understand how survivors and their families deal with and pass down memories from that time. I would love to see graduate-level courses examining music added in the future. I feel like many eminent artists, or even genres, in a broader sense, comment on social issues that many scholars are grappling with in an academic sense. Such crossover could lead to some very interesting explorations and scholarship.